The study of the geomorphological evolution of landscapes is one of the most important tasks needed for assessing the natural and man-made geohazards and risks affecting a territory. In the last two decades, instru¬mental and computational advances have allowed the development of effective remote sensing methodologies, such as those based on Synthetic Aperture Radar (SAR) Interferometry or change detection techniques (Tomás & Li, 2017). These techniques have enhanced the possibilities of making geomorphic observations and modelling. Specifically, Earth Observations (EO) techniques using airborne or satellite platforms have increased the ability to map and monitor geomorphological processes. In such a framework, historical landscape data, such as those available from aerial photographs taken since the early 1940s, are key instruments for studying the geomorphological evolution of a territory. In this work, the application of the Structure from Motion (SfM) technique to analyse the geomorphological evolution of sample areas by historical aerial photos is tested, examined, and discussed. Towards this aim, multi-temporal analysis by means of three-dimensional (3D) land models of four test areas reconstructed through the application of the SfM technique using available aerial images was performed. Although it is well known that SfM requires a considerable number of digital images and a significant overlap between them, the challenge of this approach was to reconstruct 3D land models using a reduced set of analogical aerial photos for satisfactory results. The resulting 3D reconstructions succeeded in recognizing and studying the geomorphological evolution of the test areas, represented by: a) a region in southern Italy affected by landslides; b) a territory in central Italy affected by badland-type intense erosional phenomena; c) a sector in northwestern Italy with open-pit mining activity; and d) a coastal zone affected by changes in its coastline. Despite some disadvantages that arose during the application of the SfM technique, the proposed methodology has been shown to be useful for geomorphological analysis. 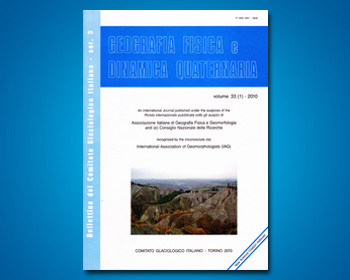 This can be considered an alternative to the use of analogical and digital stereoscopic techniques to recognize geomorphological shapes and analyse Earth surface evolution and the effects of different anthropic activities.